A thread about 7 MHz beacons around Western USA. 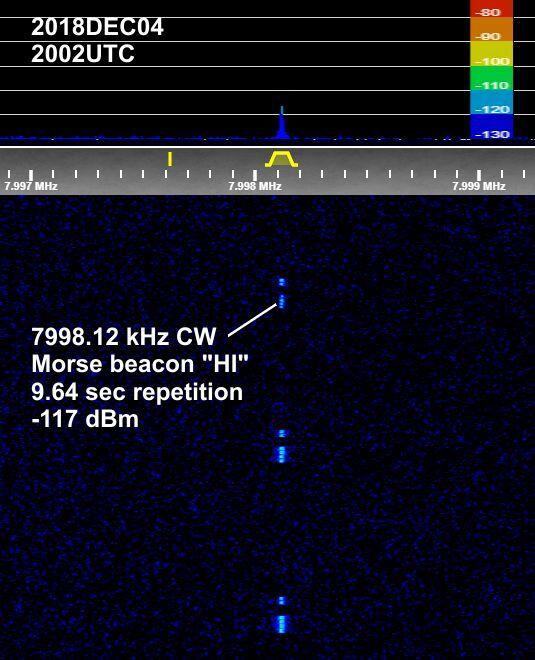 7998.12 kHz CW, Morse beacon, "HI", good readable, 9.64 seconds repetition, dit duration 128 milliseconds, -117 dBm. 7998.12 kHz CW, Morse beacon, "HI", stopped abruptly. 7998.08 kHz CW, Morse beacon, "HI", "Hiker? ", weak readable, -122 dBm. Haven't heard HI in several days. Hearing a short dasher, about every 4-5 sec, ~7998 kc at 2315 UTC. Here's the big question: "Is the HI beacon the new incarnation of Hiker?" And yes, that 7998 kHz dasher or ditter is also logged here, weak readable. But the timing seems somewhat irregular. Makes one wonder if it is a beacon or not. It could be one of the other mystery signals, because is very very much like many of the similar slow communication signals logged just like it in western USA, but on various other frequencies. Ask and ye shall receive. HI with a nice 569 signal at 0035 UTC. I have not had much any luck with these beacons lately. The problem is I don't know when the short window of propagation to my QTH currently is. I'll need to leave the SDR running today and see if I can figure out when they turn up here (if at all). Am hearing HI this morning at 1745 utc. Good signal. Is the HI beacon the new incarnation of Hiker? Airspy HF+ on a temporary 8 ft whip on outpost tripod in the back lot. HI was not around earlier today but is very strong now with minimal fading. 22:35 UTC 03MAR2019. 7998.07 KHz. HI fading up to 559 around 0015 UTC Mar 04. Lots of QRM from OTHR. Faded out completely around 0030. "HI" beacon sometimes seems to be elusive. Extremely! I have yet to catch it here, I need to figure out when the (probably brief) window of propagation is, if there is one. I've tried mornings without success, I need to try evenings next.